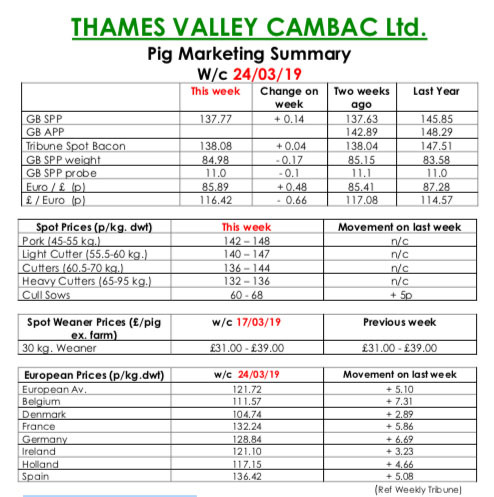 This week’s Slaughter Pig Marketing Summary, from Thames Valley Cambac, reported that major problems at one processor caused many hundreds of pigs rolled out of this trading week, meaning space was at a premium in certain plants early in the week. Demand was still relatively steady with little spark from any of the outlets. Anecdotal evidence suggests that many processors anticipated Brexit by stockpiling product in cold stores, so they had buffer stocks in case of disruption. These stocks are now said to be heavily subduing demand, while a Brexit date has been kicked down the road again. All contract price contributions stood on. The fresh meat market remained very quiet, with little interest shown. The cull sow market continued to improve, with a substantial 5p lift on the back of better continental demand, and more favourable currency. European markets surged ahead on the back of better domestic and export demand. The influential German market was up 7 eurocents, influencing its near neighbours to follow suit. Price quotes in sterling were further enhanced by a stronger Euro that ended the week up 0.48p at 85.89p. The Weaner Marketing Summary, for week commencing March 17, reported that supply improved slightly again this week and demand matched. However, some fatteners are still concerned at the current and future direction of the finished pig market. 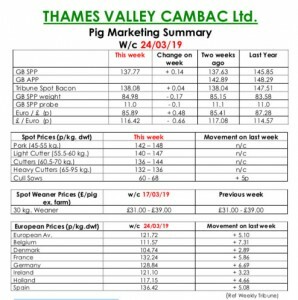 The prices announced by the AHDB saw the weighted average for a 30kgs store pig fall 68p to £45.17, and the weighted average for a 7kg weaner rise by 40p to £35.55.